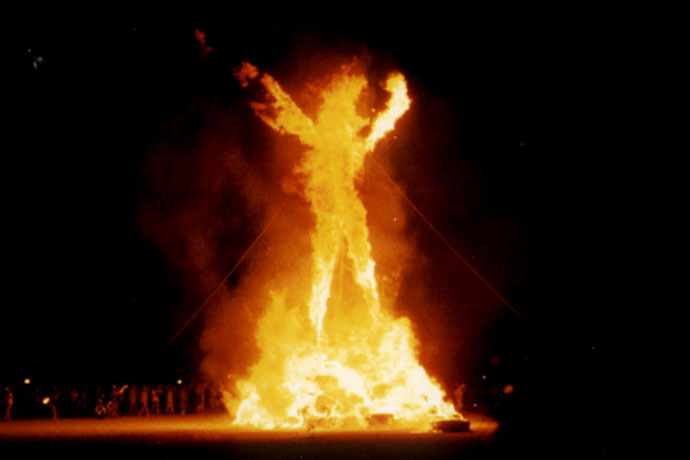 The Burning Man culture emerged organically in San Francisco in the late 1980s after a small group of friends set up an evening campfire on Baker Beach to celebrate the summer solstice and decided to burn an eight-foot wood sculpture of a man. Larry Harvey and Jerry James were the initiators of the bohemian celebration that has since expanded to become a space and experience for an intentional, utopian community and extreme creativity to emerge (Rohrmeier and Starrs 2014). Burning Man performs collectivist attitudes at an annual week-long festival each August in the Black Rock Desert of rural Nevada, which convenes more that 70,000 participants, or “Burners,” today. Though it has become its own culture of sorts, Burning Man is also a non-profit organization, which does charge an attendance fee that has risen to $390 over the years. The current vision expresses, “The Burning Man organization will bring experiences to people in grand, awe-inspiring and joyful ways that lift the human spirit, address social problems and inspire a sense of culture, community, and personal engagement.” Currently, the organization is mostly run by people who have a history with Burning Man, and who have chosen to take on larger responsibilities in a non-hierarchical fashion. The Burning Man festival allows participants to create a city from scratch, devoid of traditional leadership and organized completely by the participants themselves, which in itself can be liberating (Rohrmeier and Starrs 2014). The ethos of Burning Man is anti-materialistic and focuses on sustainable innovations, the natural environment, and forms of expression as art. 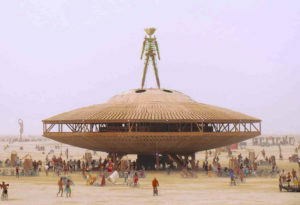 The festival involves multiple campsites, large scale art installations, and group created projects on the desert site. For example, one camp site built a mini-roller coaster, and other projects in the past have included the creation of smaller towns or campsites within the larger desert plot. Costumes and drugs are abundant, though drugs are technically illegal. Many people view the Burning Man festival as just a festival; however, it warrants analysis as a subculture because it prompts a distinctive community to guide themselves together under ten shared principles. Burning Man fosters community through interaction, curiosity, and cooperation. community promises to leave no trace of their gathering. Participants bring everything they need to survive in this climate and to create installations and shelters, and at the end they bring everything out of the Black Rock Desert with them. Becoming part of Burning Man culture is essentially determined by the way in which an individual wants their experience and creative trajectory to unfurl. The festival element of the culture is simply a short-term opportunity for people to feel engaged and figure out how they might fit into this way of life. The identity of a member, so to speak, can take formation in many ways because the group is expansive in its ideals and principles. 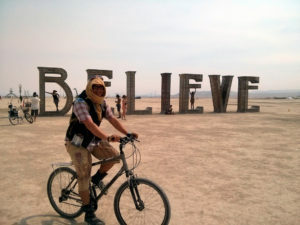 Interestingly, most of the participants and adherents to Burning Man culture are politically progressive, yet often corporately connected through industries like tech. In recent years, many of the participants have been connected to Silicon Valley in elite tech capacities like the CEOs of Facebook, Google, and Tesla. There is not a distinguishing feature or physical marker of members, though, which might be one explanation for Burning Man’s indistinguishability in realms outside of the festival. In this way, it is more important that members can distinguish each other, rather than being seen from the exterior, which reinforces the ways Burning Man fosters a network of people within its culture. Burning Man proclaims to be inclusive, but really seems to appeal most to a certain population. 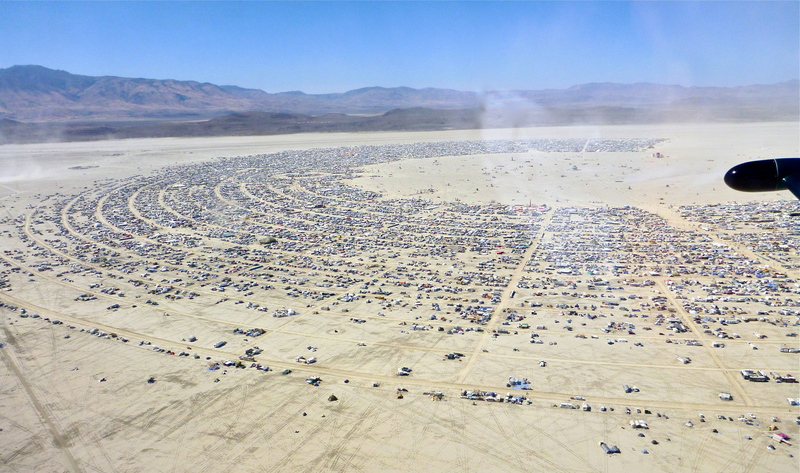 Burning Man does not represent a youth subculture, and the majority of the Burner population is comprised of white, middle to upper-class males (Rohrmeier and Starrs 2014). In a way, the primary venue of the Black Rock Desert serves as the common identity of Burners that is removed from them personally, but still serves as the driver of the culture and its visions. The sense of culture and community exuded from Burning Man requires supposition about how participants support their identification and authenticity with the group. This is a point of contention among observers due to the influx of participants who are part of the tech elite or the celebrity world. 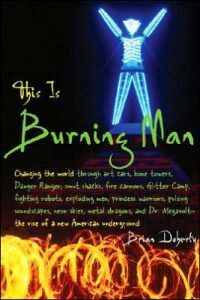 Burning Man has changed in this way since its establishment, yet the formative, collectivist ideas of the group may still constitute a culture. The philosophy of Burning Man is rooted in intention and self-governance, yet seems to be blanketed by paradoxes that make authenticity and demographic disparities an increasingly important topic (Chen 2009). Since its establishment in the 1980s, Burning Man has become a global culture that is known and experienced in countries even as far as Japan and which has grown dramatically over time from 20 participants to over 70,000 (Chen 2016). It represents a way to re-conceptualize social landscapes and sequester oneself to the power of nature and creative contemplation. Burning Man represents a culture that celebrates art, love, and freedom of expression. However, to be part of this radically “inclusive” Burning Man culture or community, arguably one must actually be an active participant at the annual festival. Aside from just attending the event, Burning Man is a way of life that causes a cultural shift in the way people communicate and relate to each other. Burning Man has undoubtedly stirred up talk and mesmerized people within the media and academic communities for its counter cultural perspective and accounts of its life changing power. 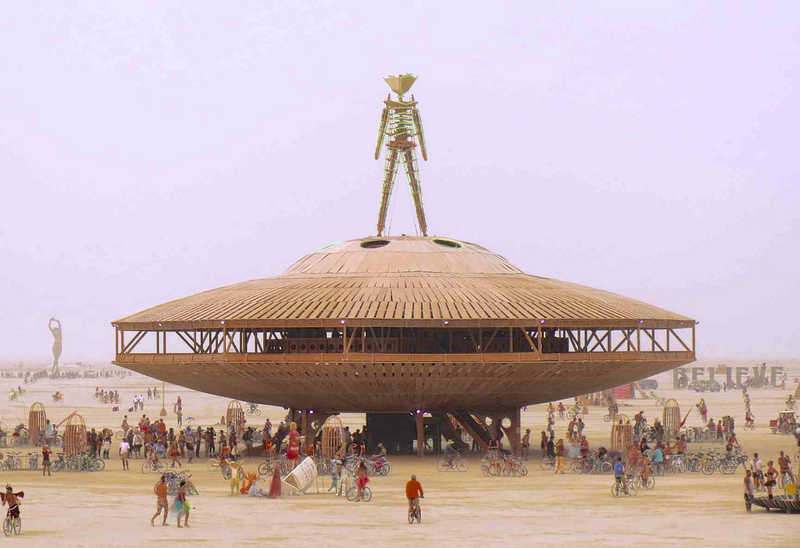 What is yet to be known, and what might drive future Burners, is how Burning Man culture will continue to evolve amidst our rapidly changing society. Authenticity at Burning Man is relevant both in terms of participants actions and responses post-event, and the innovation of the installations and micro-communities created in Black Rock Desert during the week. Burning Man is viewed by many as more than just a festival, thus it provides a foundation for ideology and principles that enter into Burners’ lives post-festival. Specifically, the art installations during the festival are a performance of authenticity because they are created by participants with original creativity in mind. Chen (2016) expands on the way in which Burners enact the guiding principles, and explains that participants “communify” labor rather than commodify labor. Therefore, participants’ contributions are valued by the collective. These practices of building community and sharing stories among others explicates how Burners maintain meaningful participatory practices that expand beyond just the festival. In addition, authenticity is often displayed through participants’ recounts of past Burning Man events that shows their longstanding alignment with the group (Chen, 2016). As Burning Man becomes more exclusive due to attendance fees, accessibility to participants narrows. Such changes in the organization of the festival influence the demographics–class, gender, and race–of Burners, and specifically impacts the perception of authenticity among participants. This idea of authenticity on the basis of participant identification is pertinent due to the incongruity of upper class, mostly white male participants. Burning Man membership is not as accessible to an audience beyond the dominant population of elite, white males, which introduces hypocrisy because the ten tenets are centered around radical inclusivity and anti-capitalist notions. However, Burning Man attempts to decentralize organizing power and shape an inclusive environment, which prompts discussions and hopefully increasing opportunities for less represented groups of people to involve themselves. The premise of the Burning Man festival is arguably perceived by some critics as a form of commodification, as attendance requires an expensive fee and it has crept into mainstream attention through media and celebrity participant attendance. 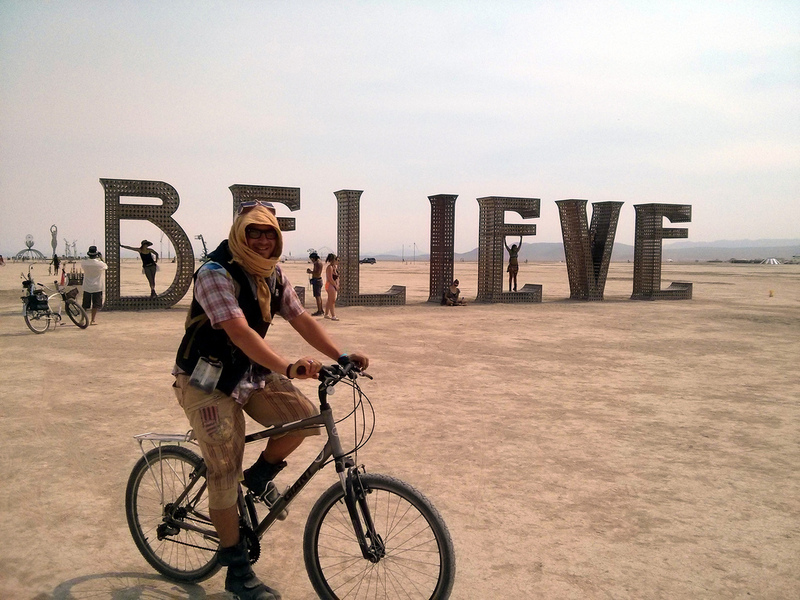 Perceptions of authenticity and the commodification of Burning Man is closely linked. In reaction to commodification, or at least arguments that support commodification, participants’ seek new methods to perform authenticity . Chen (2009) also suggests that as experiences at Burning Man change over the years, participants’ perceptions of authenticity change, too. Furthermore, as regulations and rules of the festival become more complex and rigid, and as the population of Burners grows, authenticity is eroded. The global spread of Burning Man supports claims of commodification, but enables more avenues for creativity in democratic ideology and creative expression. The constant evolution of Burning Man and annual developments both at the festival and beyond also promote flexibility and creativity for future possibilities and illusions of authenticity. In order to re-claim authenticity Burners must learn to adapt to globalization and expansion. This documentary follows the transformation of Burning Man from a small, rebellious community festival to an extensive global community and evolving culture. This documentary details the Burning Man festival through first hand videos and scenes from the annual festival in addition to featured interviews with participants. 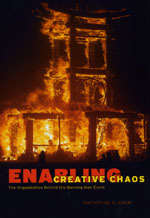 Enabling Creative Chaos reveals how Burning Man evolved from a small group to a multi-million dollar organization, and its experimentation with different management methods and strategies throughout it’s evolution. Doherty’s book details the history of the Burning Man festival and some of the Burners’ long-standing customs throughout the history of the event and group’s initiation. 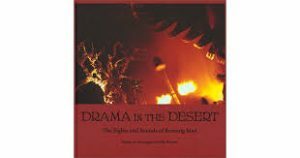 Drama in the Desert contributes to the background and history of Burning Man’s eclectic essence through its images and first hand account from a member of the Burning Man staff. Chen, Katherine K. 2009. “Authenticity at Burning Man.” Contexts 8(3): 65-67. Chen, Katherine K. 2012. “Artistic Prosumption: Cocreative Destruction at Burning Man.” American Behavioral Scientist 56(4): 570-595. Chen, Katherine K. 2016. “Plan Your Burn, Burn Your Plan: How Decentralization, Storytelling, and Communification can Support Participatory Practices.” The Sociological Quarterly 57(1): 71–97. Kozinets, Robert V. and John F. Sherry, Jr. 2004. “Dancing on Common Ground: Exploring the Sacred at Burning Man,” in Rave Culture and Religion, ed. Graham St. John, New York and London: Routledge, 287–303. Rohrmeier, K. and Starrs, P. F. 2014. “The Paradoxical Black Rock City: All Cities Are Mad.” Geographical Review, 104(2): 153–173. Sherry, John F. Jr. and Robert V. Kozinets. 2007. “Comedy of the Commons: Nomadic Spirituality and the Burning Man Festival,” in Research in Consumer Behavior, Vol. 11: Consumer Culture Theory, Oxford: Elsevier, 119–147. Bilton, Nick. 2014. “A Line is Drawn in the Desert: At Burning Man the Tech Elite One-up One Another.” New York Times. Burning Man Project. The official website for the Burning Man organization. Reff, Kenny. 2013. A personal memoir from the Burning Man festival.